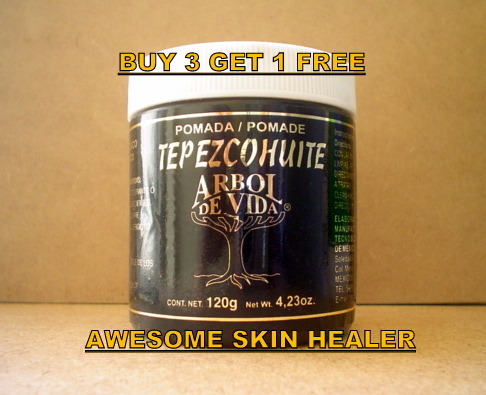 TEPEZCOHUITE SKIN CARE STORE: * TEPEZCOHUITE CREAM POMADE Psoriasis Eczema Burns Dry Skin Rosacea. PSORIASIS, ECZEMA, PSORIASIS, ROSACEA, DERMATITIS, BURNS, HERPES, DRY SKIN, ACNE, SCARS, WRINKLES, STRETCH MARKS and Many Other Skin Issues. Have a very nice fresh Lime aroma -- never stings or burns when applied to skin. It can be used as often as you like to your Skin Care and So Forth.Many people apply it to the face as an excellent wrinkle treatment.You can use it all day and all night.You Will Start to See ResultsAfter Just 1 Week of Daily Use.